Hi friends. Welcome to another Mojo Monday. Since it's one of those months with 5 Mondays in it, I've got a square sketch for you this week. It's got lots of layers, but you could drop one or two and still have a beautiful card. I had this mixed media galaxy background I made a while back sitting on my desk and thought it would be the perfect backdrop for my card. 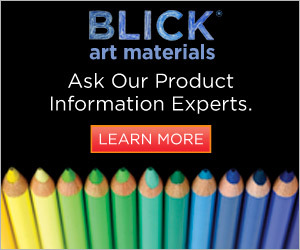 It was made with distress paint, distress oxide inks, a neo watercolor II crayon and white paint. Next I masked off part of the verse from Butterfly Grace to fit my stitched oval shape and stamped in onyx black. 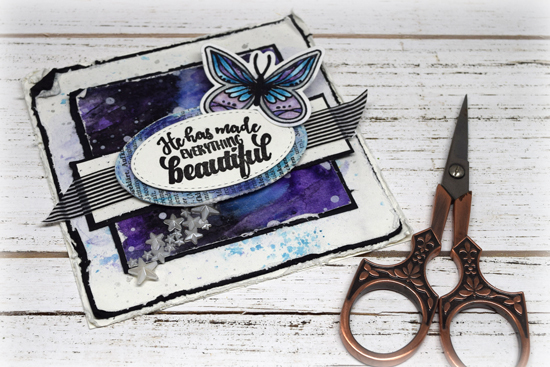 The butterfly is stamped on watercolor paper in archival black and then colored with watercolor pencils and accented with glitter and die cut with the coordinating Graceful Butterflies Die Set . For the mat behind the sentiment, I used collage medium to adhere some dictionary paper to watercolor paper before die cutting. Then I tried watercoloring with the same watercolor pencils, but everything beaded up because of the collage medium Luckily for me, I had just received some transparent watercolor ground, so added a layer of that to my oval, let it dry and it took the watercolor beautifully. Yay! I added some distressed edges and black mats here and there and did some flicking with watercolor pencils and a wet brush to make the largest white panel. And I opted for washi over the rectangle layer, rather than under so more of those stripes would show. Thanks so much for stopping by today! I hope you have a fabulous start to your week. 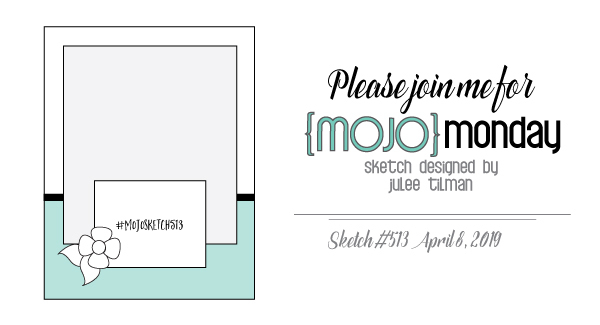 For more inspiration with this sketch, hop on over to the Mojo Monday blog for a peek at what the other designers are sharing today. If you like measurements, the ones I used to draw up the sketch are listed below. Card Base: 4.25 x 4.25"
Layer 1: 4" x 4"
Wonderful card, love the sketch this week 💖. 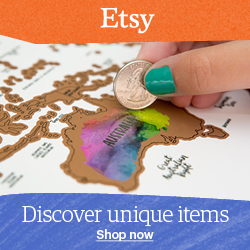 The background is so majestic, and the dictionary print and washi tape are perfect complements! Graceful Butterflies will be in my mailbox tomorrow, the USPS promises. Can't wait! Beautiful card. Love the fabulous background and pretty butterfly. That sentiment says it all. Love this set. Great new sketch, Julee and what an awesome card! Love that beautiful purple background. Love your new set! Very intriguing with so many textures! I love your bold statement! Great sketch, I have a personal affinity for ovals though I rarely use them. Perhaps today would be a great day to change that shortcoming of mine! Stunning! love the dramatic background and the inspirational sentiment. I love everything about this card! Gorgeous!!! Such a fabulous mix of colours, gorgeous BG and love the butterfly and touch of stripes. Love it! Hi Julie, love your card and had fun with your sketch this week. I just about got mine in in time :-) cardsbycarol.wordpress.com. Thanks for the inspiration! 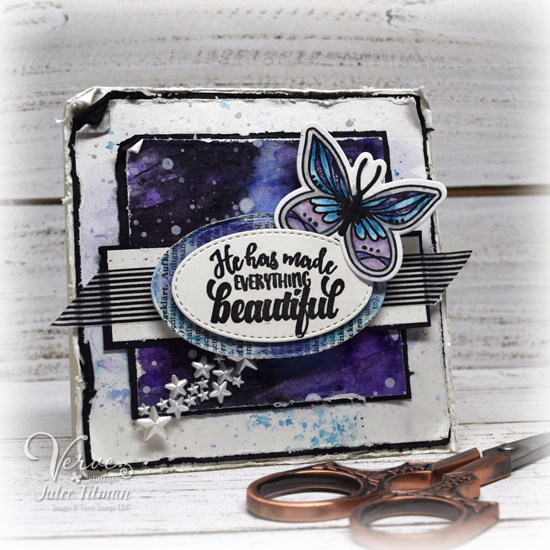 Beautiful card Julee. I love the galaxy background! The colors are so vivid. Pretty butterfly... I also love the tiny stars... along with the washi strip! Perfect!